two posts in one day! As a devout follower, Anabela, you spoil me! What a great idea for a costume, you look adorable. Please make yourself one of those dresses to wear all the time, it is soo cute! I second Tiffany, I want to make one, too! I can't wait for the etsy shoppe! also, I totally remember that song! it is adorable, and what a very good, original idea! it looks so good! where do you buy your fabric? and which book did you get the pattern from? i have a friend who dressed up as sashimi once. she painted a pillow to make it look like salmon (and it really did!) and she wore all white and used a black band (seaweed)to keep the pillow on her. is this the same song that the shaggs did? if so, yes..it really gets stuck in your head haha. candy corn! that is so cute! you are the cutest little candy corn and I just want to cuddle your flannelness! I want to see you in the cap!!! eeeeeee! you couldn't possibly be any cuter if you tried. that is the cutest idea! i'm hopeless when it comes to halloween costumes, no creativity at all. by the way, i'd like to request something for your etsy shop when you reopen. i'd love to buy one of those beautiful needle books. i'm forever losing my needles. That dress is so cute! Well done. Hi everyone! Thank you so much for your comments! I don't know if it's very original -- I did a Flickr search on "candy corn costume" and a lot of others came up. Although, really, a lot of the others were worn by babies! 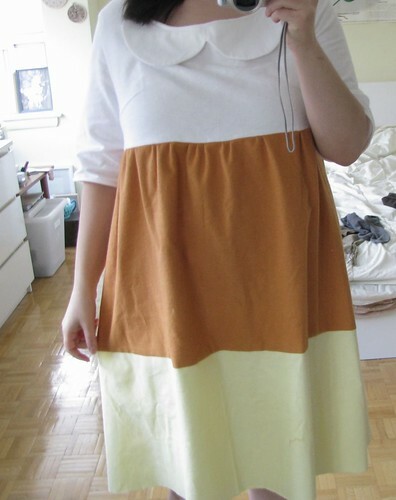 The collar was inspired by a Samantha Pleet dress I saw a while ago; it had an exaggerated Peter Pan collar. Tiffany, you have this book, right? You should make yourself a dress! Erica, you are too sweet. I was thinking of making another one, in a more "normal" fabric. I don't know if it's the most flattering dress on me, but I like it anyhow. Melissa, I got the flannel at Fabricland! I have a member card, so I go there often. I also really like a lot of the textile shops on Queen, and Designer Fabric Outlet, and The Workroom, of course. The sashimi idea is awesome! Thanks, Caitlin! I don't know the Shaggs song. This one was from a TV show called Telefrançais! April, I love you. LOVE you. Jenny, it would be an honour! Wow! Hello, Hibou (my favourite French word)! C'est l'halloween, hey. So pretty! Much cuter than my Halloween costume : Courtney Love! ahahaha, my roommate and i were just singing that c'est l'hallowe'en song the other day... i heart telefrancais! and that dress is adorbs. heheh what cute fun! I didn't actually know what candy corn was but have since wikipedia-d it and am in the know! Best of luck getting the shop in full swing - how did you print your name tag labels out of interest? Thanks! I'm so embarrassed about my terrible picture now! Rebecca, I embroidered a piece of twill tape to get that label! holy crap anabela this is amazing! seriously, so freaking adorable and such a cute idea. i was just writing how i have no ideas for halloween. maybe you can make me a costume! I was just talking to someone the other day about how much I love candy corn! This is the sweetest (no pun intended) costume I have ever scene — such a brilliant idea. what a great costume-well done! and 'merci' for reminding me of that song, i used to love singing that in school!